June 27, 2018: Treating pyoderma is not what it used to be! Tune into this complimentary VETgirl online veterinary CE webinar, where Dr. Valerie Fadok, DVM, PhD, DACVD will discuss the 21st century approach to canine pyoderma. The emergence of methicillin resistance has changed our approach to this common canine skin disease. More than ever, we emphasize a role for topical therapy, and current evidence suggests that chlorhexidine is our best choice for an antiseptic. Using the ISCAID (International Society for Companion Animal Infectious Diseases) guidelines for superficial pyoderma, this lecture will discuss the classes of antibiotics used for pyoderma, and how they work. Dr. Fadok will also review recommendations for when to culture skin, how to treat methicillin resistant staphylococcal infections in dogs, and effective strategies for treating pyoderma. Topic: Treating pyoderma is not what it used to be! 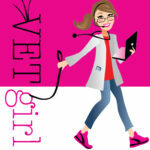 Looking for a helpful Q:A from the VETgirl-Zoetis webinar “Treating pyoderma is NOT what it used to be” with Dr. Valerie A. Fadok, DVM, PhD, Diplomate, ACVD - Click HERE! (All answers are provided by the speaker). This program 785-33007 is approved by the AAVSB RACE to offer a total of 2 CE Credit being available to any one veterinarian: and/or 2 Veterinary Technician CE Credit. This RACE approval is for the subject matter categories of: Category One: Scientific using the delivery method of Interactive-Distance/Non-Interactive-Distance. This approval is valid in jurisdictions which recognize AAVSB RACE; however, participants are responsible for ascertaining each board's CE requirements. RACE does not "accredit" or "endorse" or "certify" any program or person, nor does RACE approval validate the content of the program. so, do we still get CE credit if we’re not Vet girl Elite members? Fantastic CE speaker. Looking forward to more Dermatologic topics! !